Businesses today require more than just strong performance to survive. They require results. While it may have been an acceptable management method of the past, results at any cost is no longer tolerated in the workplace. 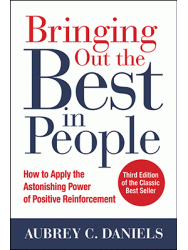 Nearly 40 years ago, Dr. Aubrey C. Daniels introduced the phrase Performance Management to his clients (and eventually the world) simply as a way to describe how to motivate people to enthusiastically do what the business needs them to do. At ADI, we know Performance Management to be more than how it is loosely used in business. We know it as a technology for accelerating behavior aligned with critical business results. It is an essential part of what is required to optimize discretionary effort, processes, systems and management practices while creating a high level of value for the organization. ADI helps clients understand that Performance Management is a scientific approach to managing behavior and provides the tools and approaches they need to be successful.